In this article, you will learn how to resolve absolute path in css file. 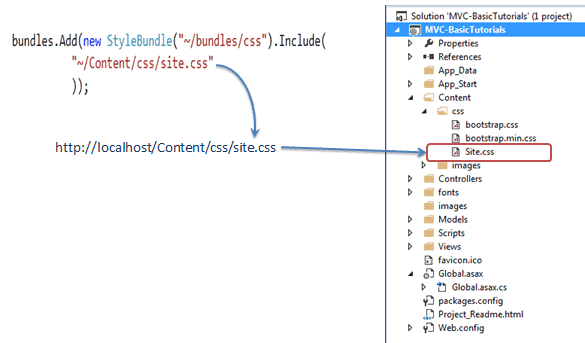 We learned in the MVC tutorial that Include method of Bundle class accepts filename with virtual path. If you open browser debugger, you can see that css file has been loaded with Status 200. However, if site.css contains images with absolute path then images will not load. For example, our following site.css contains footer style as shown below. The above footer style references the background image, which is in the separate images folder. However, browser will give 404 error because it could not find image file. If you use absolute path in your css for images then you can specify transformation class CssRewriteUrlTransform. CssRewriteUrlTransform class rewrites urls to absolute path. 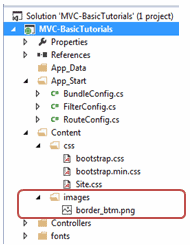 Now, image path in the css file will be transform to absolute path. As you can see in the above figure, image is loaded using absolute path from root folder.